If you have any questions about anything at all on make-your-own-invitations.com you can send me an email. I'd love to hear from you. Make these adorable Tea Party Invitations. We have a great tutorial by Ria Montefalcon to make your own invitation cards with some basic craft supplies like decorative tape and card stock. You will need to use your computer to create the invitation wording unless you decide you would like to write the invites out by hand. For more ideas for hosting a tea party we have several other stationary and DIY invitation ideas that you can check out here. There is even a free printable that you can simply print and fill out the party information details. Have fun with your tea party themed birthday celebration. Continue reading "Make your own Tea party invitation cards"
Celebrating the Holidays with a Christmas or holiday party? 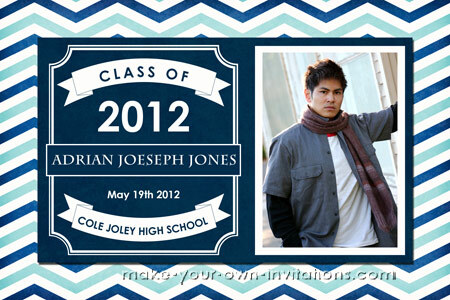 We have added a new printable invitation design to our shop. A Glamorous Black and Gold Christmas Party Invitation. Perfect to spice up your holiday party whether it be a family affair or a work function end of year celebration. Continue reading "Glamorous Christmas Party Invitation"
Make these Washi tape birthday invitations. Really simple to make with basic supplies and pretty Washi Tape. 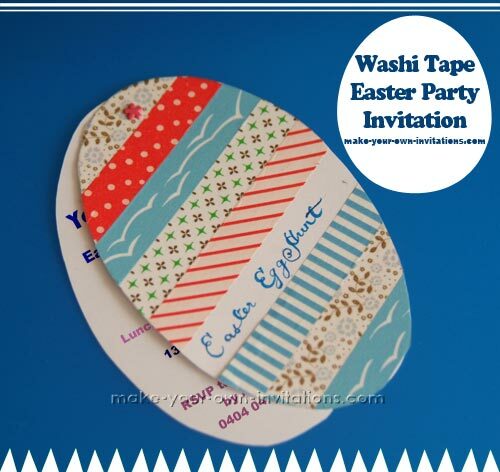 Continue reading "Washi Tape Birthday Invitations"
Easter is coming up so it's time to get your Easter invitations organised. Write your guest list, find a suitable themed invitation design you like and get busy. We have made a sweet easter party invitation tutorial for you in case you decide to make your invitations yourself. They are for an Easter Egg hunt but of course you can use them for a Sunday brunch or luncheon. Maybe you have a child who is celebrating a birthday around the Easter holiday. 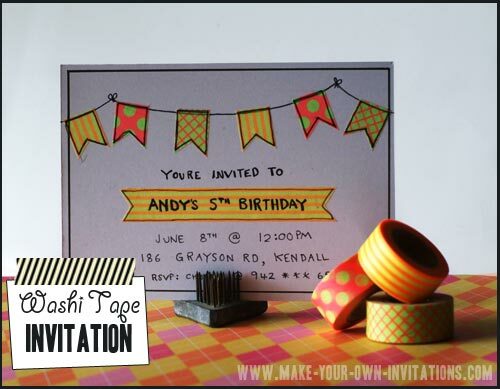 We had a bit of fun making these invites with the Washi tape and you can get the full tutorial to make them here. Continue reading "DIY Easter party invitations"
A simple Halloween Card invitation made from deep purple cardsock, some yellow and black card. This was a very simple invitation to make the different color card. It's as easy as poping a moon and some had cut bats on to the front of your card. Print the party details onto copy paper, trim and stick it to the inside of the card. You'll be done making your invitations in no time at all. 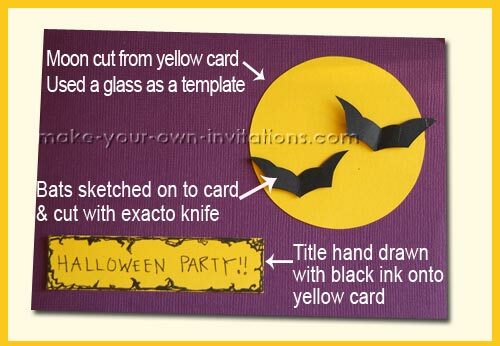 Take a look at this and our other Halloween invitation tutorials to find something for your Party. Continue reading "Bat and moon Card"
Our newest Halloween inivtation tutorial is for this spooky Spider in spider web invitation. Our nephew just loves this invitation. It's a little boy thing i'm sure. Give him creepy crawlies and he's a happy lad. The spider webs on this card are made with a hot glue gun of all things, who knew that a hot glue gun was so useful. You have to be careful not to make a mess but the end product is well worth the effort and patience. 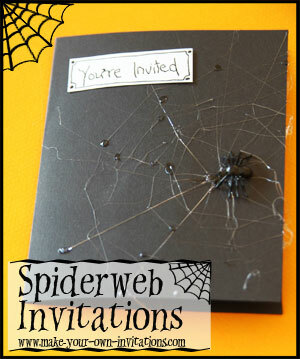 Continue reading "Spider Halloween Invitations"
Continue reading "Homemade Halloween Invitations - Make your own Party Invitation"
If you are throwing a Halloween Party on a budget with a ghost, spirits or haunted house theme then you might like the idea of making hand made ghost party invitations. 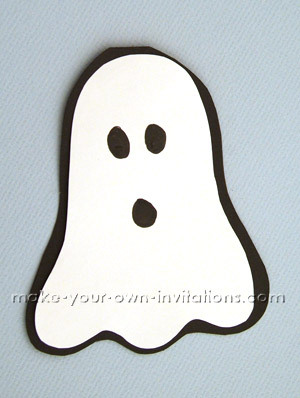 We have several ideas for making ghost invites and have a tutorial to make a spooky ghost shaped invitation. Check out our tutorial to make these Ghostie invitations and others here. Continue reading "Ghost invitations for Halloween"
There are 10 zillion free fonts (or there abouts) floating around the internet that you can use on your invitations. These are just 12 or so of our most favorite Free Halloween fonts at the moment. They are all free to download and use on your Halloween projects. 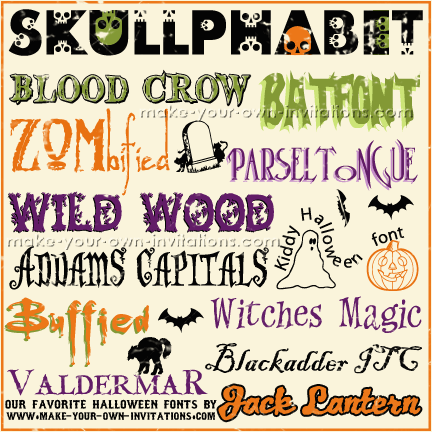 Continue reading "Top Halloween Fonts"
We are getting an early start on our Halloween invitation section this year. 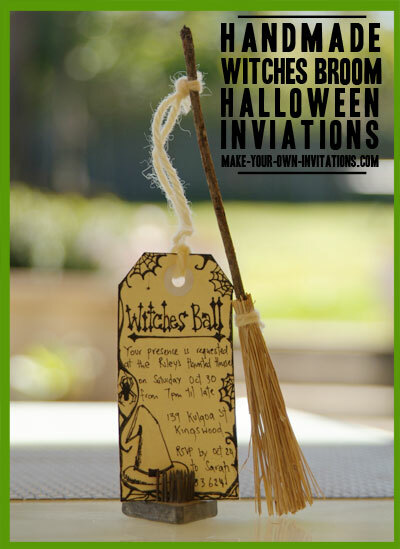 First up this year, we hav a New Tutorial to show you how to make these awesome DIY Broomstick and Tag Halloween invitations. The little crafty broom is ridiculously easy to make. All you need are a bunch of sticks and some dried up long grass which you can find in your very own backyard. Actually, I had to head out of our backyard and into the nature reserve close by to find the dried up grass because our lawns have been in top form so far this year so no dead grass in our backyard. Check back with us to see more of our Halloween Invitation tutorials to make your own spooky cool party invitations. We still have a selection of printable Halloween photo invitations just in case you decide that DIY is not for you. Continue reading "Handmade Wtiches Broom Halloween Invitations"
An invitation cleverly created with card and ribbon in the shape of a piece of wrapped candy. Perfect for a candy or sweets party and maybe even a Halloween party. Follow our step by step candyland party invitation tutorial to learn how you can make this sweet invitation for your party or celebration. 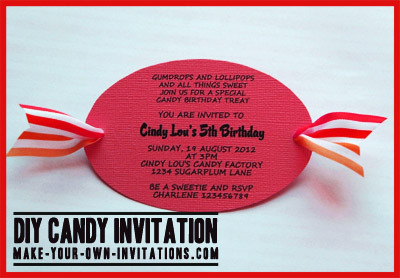 Continue reading "Candy land party invitations"
Get your motors started for a race car birthday party. Charlotte from a friends Mothers group has put on her creative apron and made these super cute traffic light cards that she used as race car party invitations for her young sons 4th birthday celebration. Of course you can guess that the theme was a super fast racing party which was perfect for the hot wheels mad birthday boy. The little guests and their mama's loved the invitations and the kids reports were that the party was heaps of fun. If you have made some cool racing car invites then send us an email via our contact page. We'd love to see a picture of your invitation. 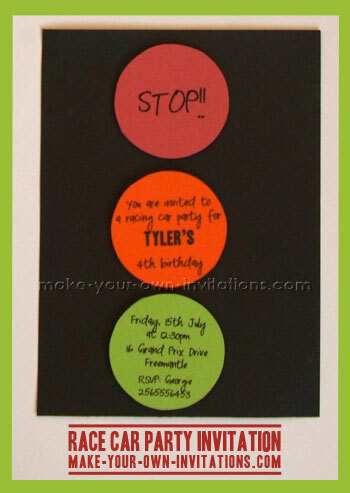 Continue reading "Race Car Invitations"
We love trying out different fonts when creating homemade invitations. You can find a broad range of free fonts on the internet, We have compiled a short list of our favorite Dinosaur Fonts For you to try. Check out our ideas for making invitations with a dinosaur theme while you're at it. Continue reading "Dinosaur invitation fonts"
Continue reading "Summer Popsicle Invitations"
How about a beach bucket invitation for your next birthday celebration at the beach! We like invitations with simple geomtric shapes that are quick an easy to cut out. A sand bucket can be created from such a shape which makes it ideal for a DIY invitation that will not take up too much of your time. Of course if we dedided to use a sand castle bucket shape that might take a little longer ( although it would look extra cool if we did) hmmm I think I might just make a few knife strokes an cut out 3 or so squares from the bottom of these invites, it actually wouldn't take that long with a craft knife an cutting mat.... I'll get back to you with an updated pic if I do it. Back to the invites at hand.... take a look at our tutorial for our Beach themed invitations and see if you might like to give them a try to make your own invitations. Continue reading "Beach Themed Party Invitaions"
Come One, Come All, to our Carnival Party. 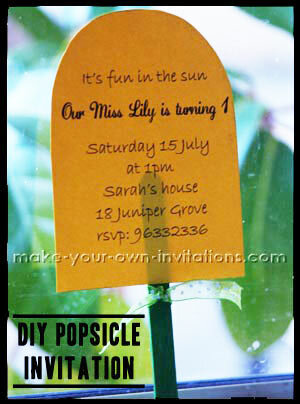 This is one of our interactive printable invitation designs. 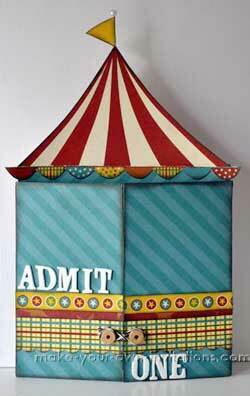 We wanted a Printable Circus invitation that not only looked good but was also fun. 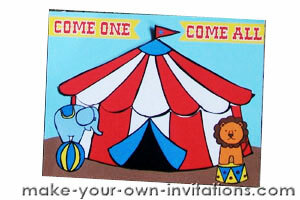 We created this printable circus party invitation in the form of a big top with a tent that slips out at the the top to reveal the party invitation on the inside. We've further embellished the design with a performing elephant and lion. We absolutely love that it is a unique and fun design. But we'll let you decide for yourself as you can download the free invitation template and print it a nd use it yourself. There is some assembley required but you can follow our simple step by step instructions and you shouldn't have any trouble at all. We promise it is worth the effort. 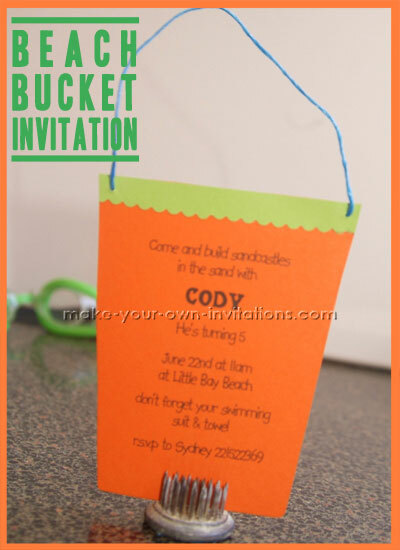 Continue reading "Free Printable Circus Party Invitation"
We have a new tutorial to show you how to make pool party invitations like these cool pocket invites. Gorgeous bright blue and yellow colors are perfect for a fun in the sun party this summer. 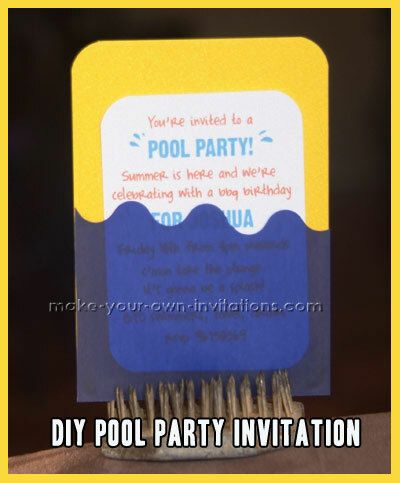 So if you are throwing a bbq or party to kick off you're summer or maybe planning a birthday celebration then eSummer party or birthday pool party then embrace your crafty side and give these easy invites a try. You wont be disappointed. All you will need to create this invitation design is some colored card stock and vellum paper if you have any - as you can see, we love the brighter colors. Some decorative scissors like the wave scissors that we used would be useful but of course you can improvise with a pair of regular snips and a steady hand. If you have any questions at all about our DIY tutorial then be sure to let us know. Continue reading "DIY Pool Party Invitations"
We created a printable princess party invitation for you to make for a girly princessed themed birthday party. We have included the free template along with some easy to follow step by step instructions to cut and put it together. As you can see it features a cute castle complete with towers an a drawbridge. The drawbridge folds down to reveal the party information - date, time, address and rsvp information. All that you will need to make the invites is a color printer and some basic craft supplies like a glue stick and a pair of scissors. 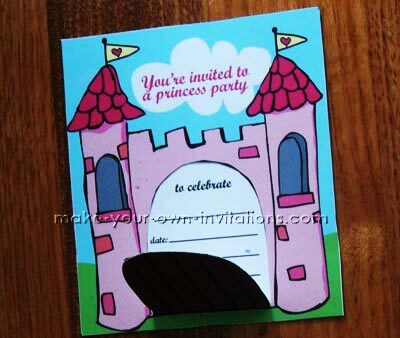 Continue reading "Printable Princess Party Invitations"
Step right up! Step right up! Ladies and gentlemen, boys and girls. We are happy to announce our new Circus invitation section with ideas and resources to make a Carnival themed birthday or baby shower invitation. In addition to our usual DIY craft invitation inspiration we also have Circus invite wording ideas, information for the best free circus fonts and also a free printable interactive party invitation and tutorial. 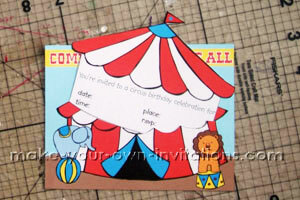 Head over to the Circus Party Invitations section and be inspired to make your own homemade party invitations today. Continue reading "How to make Circus Party Invitations"
May 2012 is here and it is graduation time for many college and university students in different parts of the globe. 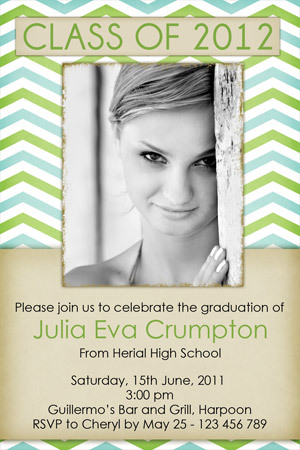 We are expanding our range of printable photo graduation invitations in the store so if you are in need of an announcement for your family and friends or an invite to an Open House celebration then be sure to check out what we have to offer. If you have a custom request then let us know your needs and we will do our best to create a pesonalized card design for you. 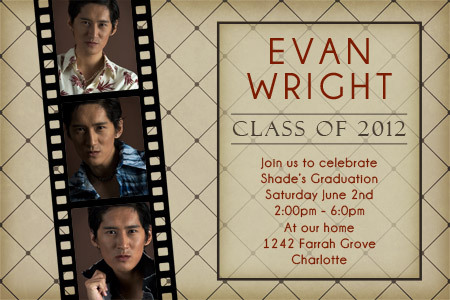 Continue reading "Graduation Invitations for 2012"